Don’t let your luggage out of sight or ask anyone you don’t know to watch it for you. This may seem like a no-brainer, but plenty of people do it! Have a map to avoid getting lost, but don’t refer to it constantly, you’ll look like a tourist- so be sure to study it! Take a picture of your kids every morning on your digital camera….just in case! The key word here is “need”, and I know that you know what I’m talking about. Taking that amazing pair of heels just in case or that extra coat are not going to be on the list. Before your final pack, lay out all of your clothes and then take half of what you think you’ll need. Sounds tough, right? But, you have probably taken a number of trips before where some supposed necessities never saw the light of day. Besides that, I’d like to bring up a few favorites that are targeted to multipurpose use. The first one is the infinity dress. I was skeptical at first, but you can actually wear it about 100 different ways. This one item easily goes from dress to skirt to top to wrap, and the layers of different patterned fabric make it appear as though you have far more than that in your bag. The classic zip-off pants are not the best looking but do help when packing light. Some of these pants will convert to capris and then to shorts and are often made of a special fabric that is quick drying and packed with sun protection. When it comes to make-up, why not tone it down and either wear less (or none) on the road or try a multipurpose powder that can give color to your cheeks, your eyes and your lips (if coated with gloss) in one? You might be able to squeeze in a bit more luggage if you are able to account for your extra personal item. When I travel carry-on, I have my backpack and a tote bag holding my netbook (not laptop), magazines, purse and other little bits and pieces that won’t fit in the pack. Sometimes, I use a small, stuffable daypack as my personal item, which can be stuffed to the brim with my netbook, DSLR camera and a number of small items, while still looking tiny and compact. However, you will want to make sure you aren’t on a super strict airline – one that actually makes you account for the weight of your personal item in addition to your carry-on. Those exist, right? If you can handle being a bit warm at check-in, wear as much of your luggage as you can. As soon as you get on the plane, you can take off some of the layers and relax. Why not put on 3 shirts, your heaviest jeans and your boots or sneakers and leave all the little things for the actual packing? While this is funny, it can save you money on baggage fees, and saving money means having more fun while traveling. Stuffing your pockets is yet another trick. I once forced myself to bring along a light jacket that looked like it was from an army surplus shop just so I could take advantage of the extra pockets. I threw in my travel alarm clock, book, reading glasses and so much more. No one really noticed that my jacket was actually acting as another carry-on since I was wearing it. If you are able to use all of the tips above, there is no reason why you can’t pack for your travels in a light, carry-on only fashion. It just takes a little bit of forethought and planning, but ladies, it is quite possible! Mobicred now gives you the option to purchase on our site and have monthly repayments come off your account. Payment will be received to us in full and you will be debited from your account once a month. 1. Visit www.mobicred.co.za and apply for an account. 2. Once approved, visit our website and add your product to cart. 3. During checkout, opt to choose payment via , On the PayFast payment screen select Mobicred. 4. The monthly repayment amount will be calculated on the Mobicred payment page. 5. We will receive notification of the payment and process your order. You’re standing in the airport terminal, watching a line of luggage move toward you on the conveyer belt. You eye each bag carefully, searching for your own and dreading two distinct and disappointing outcomes: Your bag could either appear dented and mauled with your underwear hanging out of a gaping tear, or, like a blind date gone horribly wrong, it could simply fail to show. Choosing the right luggage can help prevent these minor tragedies, in addition to other inconveniences like pesky baggage fees for an oversized piece or the embarrassment of trying to squeeze your massive nylon duffel into the overhead compartment as impatient passengers struggle to get by. Pick the right hand luggage and experience the freedom of traveling with only a carry-on — you won’t have to worry about lost luggage or extra fees if you can pack what you need in a good-sized carry-on. If you do check a bag, you’ll feel confident that it will remain intact if you select a sturdy, reliable brand. Q. What are my luggage options? A. Most bags, from backpacks to larger luggage pieces, can be purchased with wheels, back straps and/or retractable handles. 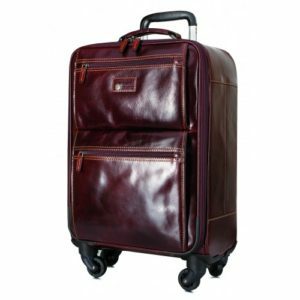 While handles and back straps are consistently useful features, some travelers get frustrated by stiff luggage wheels, which can inadvertently lead a heavy bag across the foot of an innocent bystander. If this sounds like you, look for spinner luggage with wheels that can twist 360 degrees, allowing for greater control and ease of movement. Backpacks come in a variety of sizes, both with and without frames. They are a good option for anyone planning to camp, hike or do other outdoor activities. Even large luggage pieces can become backpacks when they have padded back straps. We love these bags — but make sure to tape down any wayward straps if you check your backpack to keep them from getting entangled in the baggage carousel. Duffle bags are no longer just a device to cart your sweats to and from the gym. Many modern duffles have accessories like wheels or a retractable handle; these bags are often sold as “travel duffles.” While a traditional small or medium duffle bag will fit nicely in the overhead compartment, it may strain your arm or shoulder if you have to carry it for long distances. For extensive travel, always go for a piece that has wheels or back straps. Traditional luggage comes in two models: hard-side and soft. Hard-sided bags are molded from difficult-to-pronounce materials like polypropylene and polycarbonate. Soft bags can be made out of fabrics such as microfiber, leather, nylon, PVC or polyester. Some soft bags are expandable and can accommodate up to 25 percent more if you need the space. Q. Should I choose a hard or soft bag? A. Soft bags are more common than hard-shell luggage and are easier to squeeze into overhead compartments. These bags also absorb shock better than their molded counterparts. Soft bags are available in a wide variety of models; for example, you can purchase a carry-on with a zippered backpack attachment, or a duffel that can be either strapped to your back or wheeled through the airport. Many ultra-lightweight luggage pieces are hard-sided and might help you meet weight requirements for checked luggage. If your tightly packed bag often weighs more than you do, look into purchasing a lightweight bag, which can save you a few pounds. Hard-sided bags protect fragile items better than soft bags and are easier to clean when necessary. Whether you opt for a hard-sided suitcase or a soft one, be sure that you’re paying for good quality. Flimsy hard-sided luggage can break or crack under pressure, while cheap soft luggage can tear. Q. What size bag should I buy? A. As a general rule, go for a carry-on no larger than 45 inches (length plus width plus height) and a checked bag no larger than 62 inches (length plus width plus height), which are the standard for most major airlines in the U.S. Although you may want bring as large a bag as you can on the plane, remember that if you can’t lift your carry-on bag above your head, you will not be able to place it in the overhead bin. Check your airline’s website for information on what size bags you can check or bring onboard, and keep in mind that many airlines have different size requirements for international vs. domestic flights. When flying on a smaller airline in a foreign country, acceptable baggage weight and size requirements can be a crapshoot. You don’t want to discover that you have to leave behind one of your bags or pay extra fees when you attempt to board a 20-seat plane for a domestic flight in Costa Rica. Check baggage requirements for each flight on your itinerary. Q. What else should I keep in mind when choosing luggage? Select a bag with a bright color. Purple leopard print may not match your business suit, but you will always be able to spot it quickly on the luggage carousel. Compare different luggage interiors to see what suits your style. Lots of pouches and belts are great for the super-organized packer, and features like a plastic waterproof pouch can hold wet swimsuits or leaky shampoo bottles. Bags with a detachable piggy back clip, a looped clip on the top of the bag near the handle, allow you to clip a second bag onto a larger one. When you pick up your checked bag, clip on your carry-on and presto — you have a free hand! Test, test, test. Walk around for a bit and see if the handle is long enough for you, if you like the feel of the fabric, if the back straps are comfortable, and if the suitcase feels sturdy and durable. If you shop for a bag online, order it at least a month before your trip so you can send it back if it doesn’t feel right for you. We recommend you condition the leather 3 or 4 times a year to facilitate the durability, protect and increase the beauty of your leather product. Most drink and food spills should be wiped away quickly with a damp cloth. Only use non-petroleum based quality leather cleaner. Genuine leather is organic & through usage, its appearance will change & mature over time. 1. Put your name on the outside and inside of your bags. 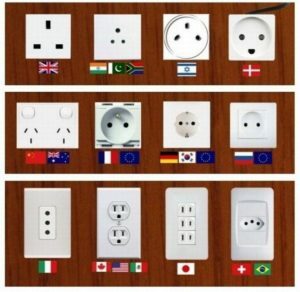 Even better, put a copy of your itinerary in each checked bag so the airline can locate you. 3. Pack all valuables in your carry-on bags. Cameras, computers, medication, wallets, heirlooms, jewelry, passports, as well as confirmation numbers, itineraries, contact information and other documents necessary to your travel should never be in your checked baggage. 4. Itemize. It sounds tedious, but when an airline asks what was in your bag, you don’t want to forget anything of value. If you make a packing list before you travel, hang on to it — this is an easy way to remember everything you put into your bags. 6. Pack a change of clothes in your carry-on bag so that you’ll have something to wear if your checked bag is delayed. If you’re traveling with a partner, consider spreading each person’s clothes between your checked bags; this way if one of the bags is lost, you’ll each still have some of your belongings. 7. Travel insurance is the best guarantee that you’ll recoup any losses. See our guide to travel insurance for more information. If your bag is lost, stolen or damaged, be sure to file a complaint immediately. If you still can’t get satisfaction, or feel the need to report the airline, contact the Department of Transportation’s Aviation Consumer Protection Division. The Cosmolite case is one of Samsonite’s most iconic suitcases: the inimitable collection boasts award-winning design, utilizing technology that sets new standards in both quality and style. By reengineering the components, the new Cosmolite suitcase just became even lighter than before without sacrificing on strength. Constructed with the revolutionary Curv® material, Cosmolite is now more than ever one of the strongest and lightest Samsonite hardside collections. No wonder a Cosmolite suitcase is being sold every ninety seconds! The evolved Cosmolite collection comes in an updated fashionable colour palette that is developed to match perfectly with the multi-tone Uplite softside case. Experience travelling in effortless style with the new Cosmolite in Copper Blush, Midnight Blue or Pearl White. Next to these trendy colours, the classic Black, Red and Silver are also still available. If you want a softside model to perfectly match your new Cosmolite suitcase, the Uplite collection is just what you need. At a mere 1.6kg for the Upright 50, this is Samsonite’s lightest cabin suitcase on wheels to date. The Uplite collection comes in three upright sizes and four spinner sizes, ranging from 55 to 78 centimetres. Next to the classic Blue, Grey and Red, the Uplite range is also available in a gorgeous Pearl/Blue multi-tone colour execution, which features copper-finished details, such as zipper pullers and dual pull handle. Next to being just as fashionable and on-trend as the new Cosmolite collection, the very classy Uplite collection also comes with a well-organized interior, comfortable handles, a fixed TSA-approved lock for secure travel and a practical ticket pocket integrated in the side panel on all cabin sizes. A true eye catcher, this beautifully designed suitcase will go with any of your stylish outfits. The fifth annual Travellers’ Choice Awards highlight the top brands that travellers around the world prefer to use on their trips. For the fourth consecutive year, Samsonite took the worldwide title of favourite luggage, as voted for by over 32.000 discerning travellers across seven different countries*. 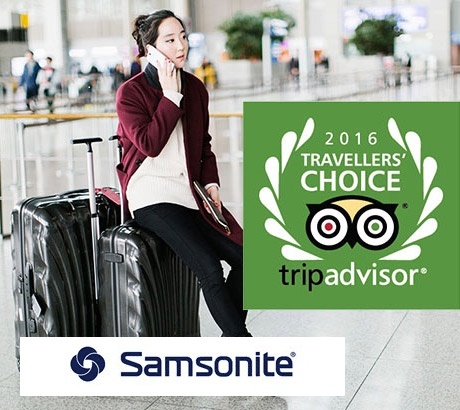 Samsonite is thrilled to be honoured by the Travellers’ Choice Awards and proud to reflect the choices of real travellers across the globe. As the world’s largest luggage brand for over 100 years, Samsonite strives to meet the needs of today’s traveller, much as they did when the brand was created in 1910. Through constant innovation and research, the brand has evolved with travellers to remain at the forefront of the luggage industry. You can read the TripAdvisor blogpost announcing all winners here. Samsonite International is the world’s largest travel luggage company. This brand has been around for more than 100 years and has had difficulties, but it always overcame it’s difficulties by coming out stronger than ever before. Founded in 1910 by Jesse Shwayder, Samsonite first begun business as a truck manufacturing company. Throughout the course of their successful business, the brand would obviously develop a reputation for producing quality and innovative luggage pieces. The brand has a variety of luggage styles that are certain to satisfy almost any traveler. Samsonite‘s primary industry focus is to produce luggage, business and computer bags, outdoor and casual bags and travel accessories. Though Samsonite is the company’s most popular brand, it also owns other luggage brands such as American Tourister, High Sierra, Haltmann, Lipault and Speck. Before founding Samsonite, Jesse Shwayder worked successfully as a salesman in New York. A Colorado native, Shwayder longed to not only return home, but to also pursue his dream to open a business. So, Shwayder went back home and that is how Samsonite was founded. Through a lot of hard work, Jesse and his brothers partnered together to create the successful company that is easily recognized today. By 1918, the brothers were finally able to nationally market one of their quality suitcases for the very first time. For the next eleven years, they would continue to experience many business triumphs as their revenue rose to over 1 million dollars. However, with the infamous stock market crash of 1929 that led to 10 years of the Great Depression, Samsonite would suffer a few setbacks. The Shwayder brother’s truck shipments dropped by fifty percent in only a couple of years time. People were struggling financially and did not have the time or money to think of purchasing new luggage for vacations. So in 1931, to account for the lack of sales, the brothers turned their attention away from luggage and changed their company name to Shwayder Brothers, Inc. They soon began manufacturing a variety of products such as license plates, card tables, stilts, doggie dinettes and sandboxes. However, the Shwayder brothers had not come to their end in the luggage industry. They were able to survive the Great Depression and by the 1930’s, their company was considered to be the most modern luggage brand. In 1939, a new and exciting piece of luggage was introduced that Jesse called ‘the Samsonite’. In fact, this is how the company obtained it’s current well-known name. This unique piece had a sturdy fiber coating and was comprised of leather bounding, and it soon became a classic to the luggage industry. Due to the outbreak of World War II in 1941, the company was forced to quit producing luggage temporarily. With more material needed for producing war materials, the country could not afford to use those materials on luggage. After the war, the brothers were able to sell 7 million dollars worth of luggage one year after the war had ended. They had gained new skills and awareness during the war and began to produce their luggage pieces using new synthetic materials. At this time, the brothers split their company into two divisions: luggage and steel/folding furniture. In the 1950’s during the Korean War, the brothers were able to increase their luggage sales once again, but they also dedicated a lot of their time to building necessary war materials such as bombs and rocket carriers. They no longer exclusively created suitcases, but they also created a variety of quality carrying cases. Perhaps one of the most popular lines in Samsonite history is the Ultralite Luggage Line that debuted in 1956. This was a milestone in the luggage industry because it was the first suitcase where the traditional wood-frame construction was not used. Instead, this new suitcase was produced using magnesium and injection-molded plastics. That was not the only exciting thing that would occur in the company during 1956. The Shwayder brothers were finally able to begin expanding their company internationally. Apart from the United States, they now had a separate Canadian subsidiary as well as an export sales department centered on Europe. Today, Samsonite products extend all over the world in America, Canada, Asia, Europe and Africa. By the 1960’s, much of the Samsonite company was now being run by Jesse Shwayder’s son, King D. It can be said that King is responsible for the establishing the company as the world’s leading manufacturer of luggage and attache cases. However, it would not stop there. By the early 1970’s Samsonite had developed an extremely successful line of soft sided luggage and new factories were created in Arizona and New Mexico for the purpose of manufacturing this new soft sided luggage. Now, Samsonite was considered to be the top luggage manufacturer in the entire world. However, in 1973 Samsonite was purchased by one of the world’s largest corporations – Beatrice Foods. The company allowed Samsonite to continue business, and it offered financial support as well. Throughout this time until the early 1990’s, many companies would buy and sell Samsonite. In the early 1970’s, Samsonite’s influence as the top luggage manufacturer began to diminish. This setback can be attributed to poor management of the company. To solve to this problem, Beatrice, who at the time still owned Samsonite, brought in Malcom Candlish to be the company’s new leader. A consumer products industry executive, Candlish helped restore Samsonite to it’s former greatness by starting cost cutting programs, laying off workers, and hiring more aggressive new employees. In fact, by 1989, half of the company’s original employees had been replaced. To further satisfy consumers, Candlish also launched a new study to find out exactly what they wanted. This study eventually led to a new product known as ‘The World’s Greatest Garment Bag’. Extremely successful, that product was soon followed by many more soft and hard sided luggage products. Once again, Samsonite was the top luggage manufacturer in all of the world. The company was more successful than ever, as it was generating approximately 300 million dollars worth of annual sales as well as controlling 12 percent of the luggage market. Samsonite’s growth would not stop, and by 1989 it now generated around 430 million dollars annually! Candlish was continuing to succeed at his job and he always searched for ways to reduce costs and invent new luggage pieces. In spite of the recessions of the 1980s and 1990s, Samsonite continued to flourish, although their parent company, E-II filed for bankruptcy. After this dilemma, Samsonite became a subsidiary of a new company called Astrum International Corp. The former E-II executive, Steve Green, now became the new chairman as well as chief executive of the company. Through Green’s leadership, Samsonite continued expanding. Through the purchase of other luggage brands such as American Tourister, Samsonite’s annual sales increased dramatically. In 1994, Samsonite generated an estimated 634 million dollars worth of sales. More than ever, the company was truly seen as the world’s leader in manufacturing luggage. In 1995, Samsonite finally regained it’s independence when Astrum announced that they would now split into two companies. One of those companies would now be the Samsonite corporation! This new company was able to keep to keep the Samsonite and American Tourister divisions and Steve Green still planned to be the head of the company. Samsonite was now expanding more so than ever, and they extended their product line to luggage racks, golf and ski bags, camping gear and computer and camera cases. To emphasize this even further, in Samsonite’s early days, owner Jesse Shwayder and his brothers made a business ad which pictured themselves standing on the suitcases to demonstrate their durability. This was especially significant because all of the men in the picture weighed more than 1,000 pounds together. In fact, the brand name Samsonite was originally derived from the Biblical character, Samson who was so famous for his strength. Recently, Samsonite’s marketing campaigns have not only continued to advertise how durable the products are, but how lightweight they are also. This can be seen in the company’s new Lift2 Luggage Line that debuted in January of 2014. The tag line for this new product is, “Light meets might”. While other brands turn toward celebrities to endorse their products, Samsonite does otherwise. 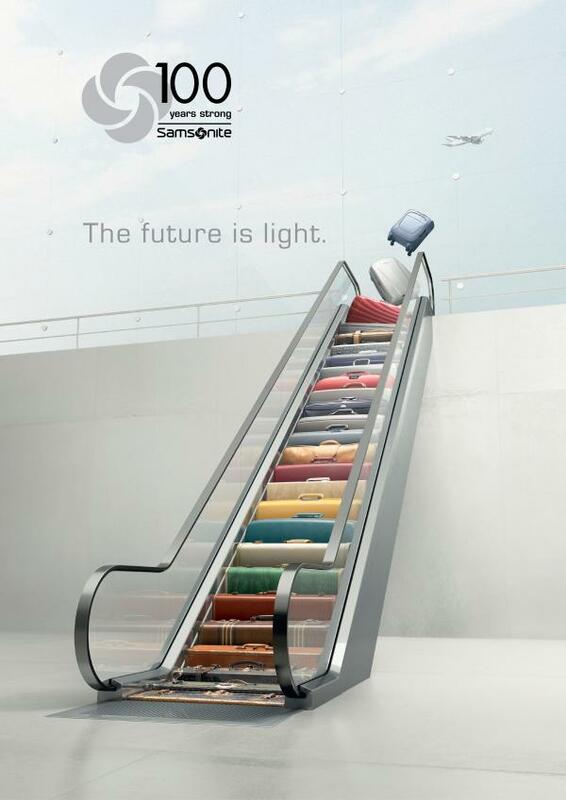 Instead, Samsonite makes their products the center of their advertisements by implementing unique, innovative features to their luggage pieces. In the brand’s early years of development, new features that were new to the luggage industry were implemented into their products. Features such as wood-frame construction, strong handles, rayon linings, fiber finishes and secure locks may not seem very innovative today, but they were revolutionary when Samsonite first introduced them. Even more impressive, a newer Samsonite product is the Micro Samsonite. However, this suitcase is unlike any other suitcase you may have heard about. Not only is this luggage piece part hard shell case, but it is also a kick board-style scooter! Simply extended the integrated upright handle and three-wheeled kick board and you can now glide across the airport while you catch your flight. Upon your arrival at your gate, you can easily convert the scooter back into a carry-on bag that fits conveniently above in the overhead bin of the plane. This new and modern creation serves as the perfect example the type of innovative, durable and quality product that Samsonite has had a reputation for producing over the years. Another modern example that shows Samsonite’s innovative spirit is the new suitcase known as the Lite-Locked. This new suitcase boasts the three point locking system that allows even greater security for travelers! In addition, the suitcase is made from Curv, a material exclusive to Samsonite. As a result of using this material, the luggage is extremely durable and impact resistant. The Lite-Locked glides smoothly through the airport due to it’s spinner wheels that make it even more lightweight than ever. It serves as an example of the company’s durable, innovative products that will continue to be seen for many years to come.